Group therapy is a cornerstone of alcohol and drug rehab. No matter what treatment paradigm in which substance use disorder (SUD) sufferers choose in the pursuit of their recovery, there will invariably be some level of group dynamics integrated into their program. In the addiction treatment context, the group therapy process involves the gathering of multiple people struggling with substance use disorder to share their experiences, vulnerabilities, and accomplishments in recovery. In his renowned and repeatedly cited Theory and Practice of Group Psychotherapy, psychologist Irvin Yalom correctly asserts that most participants feel as though they’re “alone in their wretchedness.” The group therapy process is meant to help those in treatment build a community and have a safe and non-judgmental forum in which they can share their stories and struggles connected with their drug and alcohol use. The Substance Abuse and Mental Health Services Administration (SAMHSA) indicates that group therapy can have curative forces that are not always experienced by the client in individual therapy. Group therapy sessions usually consist of between four and 10 participants, typically last around 90 minutes, and meet either weekly or on a timeline in accordance with the parameters of the participant’s treatment program. Meetings are led by experienced and credentialed facilitator. Group therapy for alcohol and drug rehab can be conducted in an inpatient, outpatient, or partial-hospitalization setting. In a controlled, supportive, and non-judgmental setting, participants take turns discussing their positive and negative experiences from the prior week or that are ongoing in their lives, and how those experiences have impacted their recovery and overall mental health. After they’ve finished speaking, fellow participants are encouraged to provide affirmation and/or feedback. Psychoeducational – Participants learn specific behavioral therapies like anger management, dialectical behavioral therapy, and motivational interviewing. Interpersonal Learning – Members talk about how they feel in relation to each other and focus primarily on what’s happening in their lives outside the group. Hybrid Group Therapy – Participants discuss their lives both in and out of recovery and how they’re interconnected. Cognitive Behavioral Therapy – Participants identify and address distorted beliefs and problematic behaviors to cultivate new thinking and behavior patterns. As far as membership is concerned, there are generally two types of group therapy: fixed and revolving. Fixed groups have the same members throughout the entire process, and are ideal for those who are at similar or identical points within the treatment and recovery processes. These groups also help members establish long-term connections for the basis of lasting relationships. Revolving groups remain together only as long as each participant accomplishes their goals and may accept other members after others leave. Patients choose fixed or revolving groups for different reasons. SAMHSA identifies the primary distinctions between fixed and revolving groups and discusses in-depth the protocols that govern successful administration of both. There are also different kinds of group therapy for alcohol and drug rehab based on an identity of the population, including but not limited to men, women, teenagers, LGBTQIA+ patients, single parents, minorities, and more. Each of these populations faces different factors that lead to and sustain their substance use, and having a group of people who are experiencing similar obstacles helps facilitate the healing process. These groups mirror the dynamics of general-identity groups and include participation in specific therapeutic techniques and, if applicable, social and recreational activities. As the group therapy landscape becomes more and more inclusive, more and more populations are able to access group therapy that speaks directly to them. How Long Does Group Therapy Last? The timeline for group therapy will vary based upon the aims, techniques, and inherent nature of the group. There are essentially two types of temporal paradigms of group therapy for alcohol and drug rehab: time-limited and ongoing. Time-limited groups request that members adhere to the number of meetings and time limits for each session that are set forth in the group criteria. Ongoing groups allow patients to attend meetings at their own pace based upon progress and continuing care needs. Beginning (Introduction) – Participants learn the group’s aims, time parameters, therapeutic techniques, and all other pertinent information. The time it takes to complete these steps will vary based on group dynamics and patients’ overall progress. Who Leads Group Therapy Sessions? Group therapy moderators are usually mental health professionals who are trained to administer whatever type of therapy the group offers. Some types of group leaders may include social workers, psychologists, psychiatrists, or substance use counselors. Group therapy not only works; it has become a fundamental element of modern behavioral healthcare. The process of group therapy has been universally endorsed by institutional authorities within behavioral healthcare. The American Psychological Association (APA) reports that more and more individuals are choosing group therapy in an outpatient context as a more affordable and supportive alternative to one-on-one counseling. 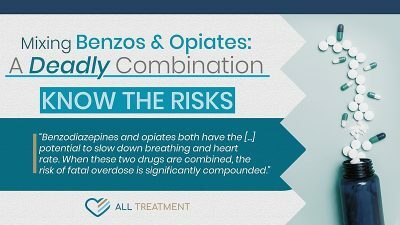 in the context of addiction care, group therapy occurs right alongside individualized counseling and specialized supplemental modalities that address each patient’s unique care needs. The process can also help those who have been victims of acute trauma like sexual or other types of assault; terminal illness and more. Group therapy helps to humanize addiction, trauma, and other types of mental health issues and provide a positive and supportive sounding board to destigmatize these issues. It also helps participants step outside of their own situations and get objective and constructive feedback regarding their conduct, care needs, and decision-making. Researchers and clinicians have written extensively on the clinical and lifestyle benefits of group therapy, including one comprehensive piece published by Psych Central editor Margarita Tartakovsky, M.S. A Sense of Community – Simply put, group therapy helps participants feel less alone. This support gives patients the confidence and emotional strength they need to maintain recovery in their daily lives. Ability to Empathize – Group therapy helps participants draw strength from their ability to help others and to use their experiences to inform and guide their own conduct. Access and Articulate Emotions – Group therapy helps participants find their own voice and use it to enrich their own recovery and support fellow participants. Education – Participants learn about the disease of addiction and develop behavioral coping mechanisms in a safe, supportive, and collaborative setting. Empowerment – Group therapy helps participants develop a sense of stability, routine, structure, and confidence. Relapse Prevention – Participants gain the tools they need to effectively avoid relapse during the more stressful parts of the recovery. Positive Thinking – Participants are better able to cultivate optimism and positive thought patterns to apply to daily life in recovery. Logistically speaking, group therapy can provide needed support during vulnerable periods and provide immediate assistance with re-entry into treatment, should participants experience a setback. While actual clinical group therapy for alcohol and drug rehab may cease after treatment, patients are encouraged to attend group meetings well after their rehab program has concluded so they can have an ongoing network of support and increasingly stronger safety net to avoid relapse. There are group meetings all over the country through organizations like Alcoholics Anonymous (AA), Narcotics Anonymous (NA), SMART Recovery, and others. Very often, the transition out of treatment into everyday life can be the most challenging part of the recovery process. Attendance at group therapy meetings is crucial to help patients get emotional and, at times, logistical support they need to continue to rebuild their lives and maintain their sobriety. Issues like family estrangement, job loss, health issues, and mental health are just some of the issues that those new to the recovery process face as they complete their treatment program; regular participation in post-treatment group therapy helps make these issues more manageable. Many rehab facilities will offer contact information for local group therapy meetings as part of the outgoing patient’s aftercare plan. How Do I Know If Group Therapy Is Right for Me? Before patients enter any kind of group therapy paradigm, they must usually undergo a clinical assessment to determine their eligibility in accordance with established criteria. Many of these issues can be worked on to help patients eventually become eligible for the process. Many are reluctant to try group therapy for alcohol and drug rehab because they don’t feel comfortable sharing their private experiences or putting so much of themselves out there. The reality is that group therapy strips any sense of pretense, judgment, or ego and assembles individuals who are all going through similar issues—there’s no reason to be ashamed or afraid of the process. Don’t let fear of judgment or stigma stop you from getting the help you need. 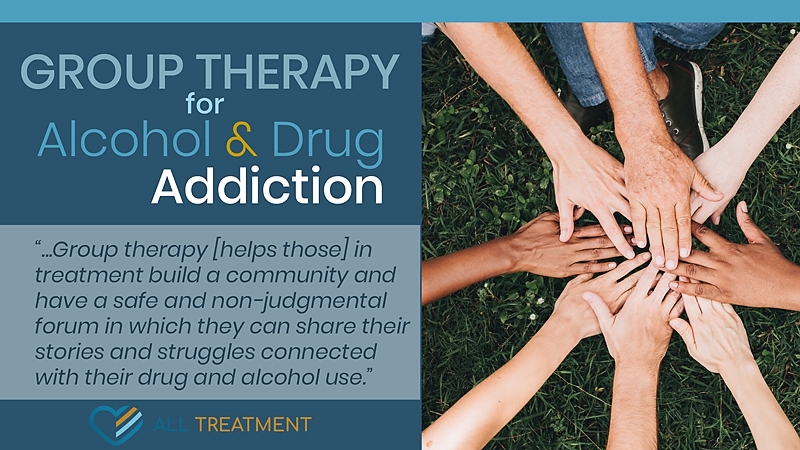 If you or your loved one is battling SUD, group therapy can be an ideal clinical resource to help you start your recovery, build a community of support, and overcome drug or alcohol addiction for good.